This may be nothing Cure related at all, but Tim Pope posted this on Twitter today - "@timpopedirector: Things are afoot; me lips are sealed." 1. The Cure never said there would be an announcement today. That came from the South America media & the promoters. And as a friend said last time we went through this, never trust anything a SA promoter says. :) So if nothing happens today, blame promoter hype, not the band. 2. There might have been a misunderstanding in the media on just what was to be announced today. The Biggest Festival In The World did have a countdown clock to their big (and very underwhelming for a festival with that name) announcement, and did reveal part of their lineup today. However, their servers crashed, there was much confusion & disappointment, but so far, nothing about The Cure playing there or anywhere else in SA. But they HAVE added a 2nd day for the festival, with no bands listed as of yet. 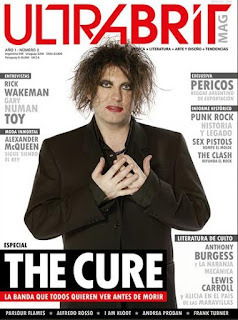 Cure booked for Argentina in April or May? "Just writing you to let you know that a TV journalist and musician from Argentina called Camilo Garcia has announced on twitter that TC have signed for playing at River Plate Stadium in April or May. And he seems pretty sure about it. Of course I know that it is not official until the band announces it but he appears to be quite sure! 27 nov @camilogarcia - Bueno ahí va: Primicia Mundial, entre abril y mayo The Cure en River! Obviously, this is in no way confirmed or official, just the start of what will likely be the usual flood of live show rumors for the new year. I almost hate posting this, as South American fans have been let down so many times in the past. But with Robert saying there are plans for a South American tour in Spring 2013, maybe, just maybe, this will be the time that the rumors actually come true. Fingers crossed for you! And for North America, too. Update (12-12-12): Cronista (English) is running a story about this today. They seem to be guessing the date is April 3rd and I think they are saying it's a festival with a bunch of other bands? Also looks like they think an anouncement will be made Dec. 21st? Can anyone help me out with this? Thanks! Yeah, the above is correct. Thanks to Z for this translation of the article. Update (12-15-12): La Nacion (English) is also running a story, mainly about the Chile concert, but also about the Argentina show. Again, all of this is supposed to be officially announced on Dec. 21st. The official announcement about all of this is said to be happening on Dec. 21st.